Your adorable twins will look stunning in their matching Personalized Twin Infant bodysuits. Be sure to order one for each baby so they can match for the first portrait together. 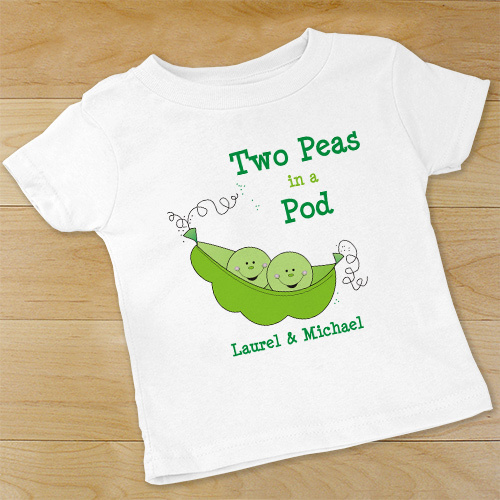 Our Personalized Two Peas in a Pod Twin Infant bodysuit is available on our premium 5oz. 100% white cotton Personalized Infant bodysuit with crew neck, double-needle hemmed sleeves and binding at the legs with a three snap bottom. Machine washable in infant sizes NB-18 mos. Includes FREE Personalization! 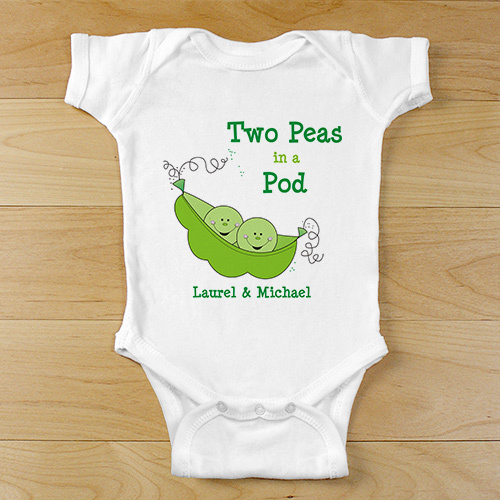 Personalize your Two Peas in a Pod Twin Infant bodysuit with any two names (ex. Laurel and Michael). I did not realize both names of the babies would be on one creeper--I would have preferred the option to put one twins name on one and the other name on the other...but they are still cute! Take a look at our entire selection of Personalized Gifts For Twins. Our unique twin shirts, rompers & baby bibs are wonderful personalized gifts & make great Personalized Twin Gifts for both of them.